Imagine a cell phone that folds in half… no, we’re not talking about those old flip phones that were so popular in the early 2000’s. We’re talking about a totally flexible cell phone whose touch screen can bend and fold. This isn’t a current technology but with the innovation of a new bendable lithium battery, we are well on our way to a whole suite of innovative bendable, flexible technologies. The future holds endless possibilities! In early October 2016, Panasonic revealed the innovation of its new bendable lithium battery at Ceatac: a Japanese technology expo. Currently, the battery is said to have applications in fitness bands, watches and smart clothing but its small capacity means that its use in power hungry smartphone technology is still a way off. 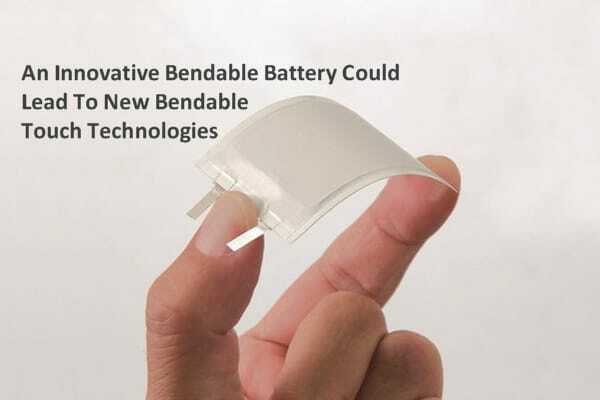 Panasonic’s bendable battery is only the first step towards the emergence (and probable explosion) of new flexible technologies, which will certainly break the mold of today’s current and very similarly designed devices. The battery itself is 0.55mm (0.022in) thick and can retain its characteristics while being bent to up to 25 degrees. Today’s giants in technology are constantly looking for new ways to surprise and delight consumers. Being able to take a step outside the norm and deliver a new curved and flexible design, perhaps even with a foldable display may not revolutionize the applications of such technologies, but they certainly will delight consumers! Imagine folding your iPhone or Android phone in half and stowing it in your pocket. Such devices would also be far less likely to break and shatter, owing to the fact that they are no longer brittle and rigid. This is just one possibility on the road ahead, but that road is indeed long and littered with challenges. Flexible batteries are only the first step in designing electronic devices that can bend and flex. There is a grand suite of other design considerations to be made – the entire device needs to be made from flexible components and materials. Samsung is allegedly working on a flexible phone and independent technology journalist site, Patently Mobile, have published an article about a fascinating rolled-up smartphone design. According to Panasonic, they will begin shipping their new flexible lithium batteries towards the end of this month. As for the possibility of bendable smartphones, we’ll have to wait a little longer for that… but perhaps not very long.